Mobile Phones Fan: Use Wireless Earphone with HTC One X ...as a Remote Shutter? 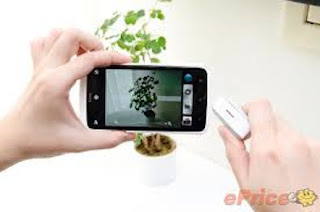 Use Wireless Earphone with HTC One X ...as a Remote Shutter? Turn up the vol...er, smile! Yep, that's the volume control for a pair of standard bluetooth earphones used as a remote shutter control for HTC's One X Android smartphone. Let that sink in, for a second. After pairing the two devices, you can manipulate the headset's volume switch to actuate the phone's camera. Not only is this a very cool trick, but MobilePhonesFan would like to point out that it also offers practical applications, like for security. Or stalking. Meanwhile, we know you're wondering how it works. Our best guess: this behavior is derived from the phone's camera firmware; HTC's 'One' series phones are the first with ImageSense. In fact, only two of them have the new firmware: HTC's One X and One S.
That's key. Leaving ImageSense off the One V -- their budget 'One" model -- shows HTC considers ImageSense a valuable add-on. And there's good reason to agree; ImageSense brings a host of new features, including (not coincidentally?) super-fast shutter response. If ImageSense is directly related to bluetooth reception, we don't know why. Could be a remnant of some planned imaging function that was axed before release. Or maybe BT is required for some HTC-branded camera accessory, to be released later. Anyway, we know the trick works with a variety of wireless earphones and headsets. But we should also note that some bluetooth headsets (mostly older units, plus a few of the recent models from Motorola) refuse to pair with HTC's One X. Go figure. Obviously, your mileage may vary but, hey -- it's worth a try. If you do, please share your results in the comments.